Canard-Duchêne is a small negociant located in Ludes in the hills of the Montagne de Reims who makes Pinot Noir dominant wines. I'm drinking my first ever as I write, and I must say that I am impressed (tasting notes below). As the story goes, they were formed in 1868 when a local cooper (barrel maker) married a young lady from a family of grape growers; respectively named Victor Canard and Léonie Duchêne. Although Canard means "Duck" the rumor that the name comes from large numbers of nearby ducks is false, yet amusing. The house stayed under family ownership for 110 years until 1978 when Louis Vuitton Moet Hennessy bought them. They are now owned by an ex-banker, Alain Thienot, who returned to Champagne to make Champagne! They are located in the town of Ludes in the northern hills of the Montagne de Reims, and noted for their superb Pinot Noir. Probably most popular in France, they are also imported to the US, UK, India, and Japan (reference Wikipedia). At one point they were imported to Russia for The Court of Tsar Nicolas II. They have two sets of wines, their "Authentic" wines and their "Charles VII" Non Vintage wines. Charles VII wines are their "premier wines" first introduced in 1968 at their 100 year anniversary, and marginally more expensive than the authentic series, although on a par with their Authentic Vintage. Their Authentic series includes the standard Brut (45% Pinot Noir, 35% Pinot Meunier and 20% Chardonnay with at least 20% reserve wines), Demi-Sec, and Rose (50% Pinot Noir, 20% Pinot Meunier and 30% Chardonnay). It also includes their Authentic Green, a 100% organic made in a lighter apertif style, a Cuvee Leonie aimed at restaurants and having a larger percentage of reserve wines and mature wine flavors. Their Authentic Vintage or Millesime is made from predominately Pinot Noir and aged for 5 years before release. It is their only vintage wine, and based on what I've tasted absolutely a winner! The Charles VII range includes a Brut (55% Pinot Noir and 45% Chardonnay), Rose (50% Pinot Noir and 50% Chardonnay), Blanc de Blancs and Blanc de Noirs. 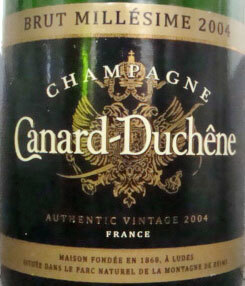 Tasting Note: Canard-Duchêne Brut Millesime 2004 - January 2013, rated A/A- - I absolutely loved this and it is a true bargain at about the $40 I paid on sale! The nose has melons, green apple, and lime initially. With some air, chalk and hints of mint and cherry emerge. The cherry grows over time. On the palate we have melon, lemon meringue, perhaps some dandelion flowers, vanilla pudding, a little orange and ripe cantaloupe. Over a little time a creaminess and lingering and wonderfully long cherry emerges.